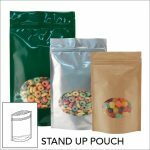 Stand up bags are more popular for the consumers and traders with the rapid development of the flexible packaging industry. The stand up bag depend on its own advantages, taking an important role in the packaging industries. So today we will talk about the advantages of the stand up bag. Please see more details below: 1. Stand up bags are highly chemically resistant, shiny, partially transparent or translucent. Most of the stand up bags are good insulators. 2. The stand up bag with zipper are light and fastening. It can be produced in large quantities with cheap price. 3. Stand up bags are fast and safe. It is safe to ensure that our products can be transported safely and reduce transportation risks during transportation. 4. This kind of bags could heat seal fastness, pressure tolerance and fall, even if it is not careful to fall from the height will not cause the bag to rupture, not leaking, greatly improved product safety. 5. The stand up bag has excellent sealing properties and strength of composite materials. It is not easy to crack and leak. 6. Stand up bags have the advantages like the light weight, less material consumption etc. 7. The stand up bag has highly performance in the term of anti-static, ultraviolet ray, blocking oxygen and moisture, easy sealing and other high and so on. All above are the top 7 advantages about the stand up bags. Pls click www.bestpackagesolutions.com for more information. Please do not hesitate to contact us for any questions, our friendly customer service will be more than happy to assist you.